StandUpGirl is a 501(c)3 charitable organization dedicated to providing pregnant or at risk adolescent and young adult women with insight into alternatives to abortion. The mission is to change hearts and save lives by educating young women on the development of the unborn child and alternatives to abortion. Standupgirl.com is a rapidly growing website whose scope is world-wide. We have volunteer “StandUpGirls” who moderate the site’s chat rooms, blogs, forums and respond to emails – from across the United States as well as in Canada, Africa and Japan. Young women from all over the world are coming to StandUpGirl looking for information about pregnancy. They find educational material, real answers to their questions, and a community of women they can talk to about their unplanned pregnancies. StandUpGirl.com currently has over three million visitors each year, and while it is a great encouragement to see this many young people coming to the site, we are barely scratching the surface of the potential number of visitors on the internet. Perhaps the most important component of the website is the real-life stories of girls facing their own crisis pregnancies and how our StandUpGirl team provides personal and individual guidance and encouragement to help these women make a choice that they and their baby can live with. The team provides visitors with contact information of local pro-life pregnancy centers where they can get the support and resources they need to journey through their pregnancy. Most guests remain on the site an average of 23 minutes, looking at phenomenal fetal development photography, life-like illustrations and remarkable videos. StandUpGirl.com is one of the most visited abortion-related website in the world! This energetic and beautifully designed website can now be viewed in several foreign languages and the StandUpGirl App can be downloaded from the Android and Apple markets. Love’s Choice was created to take an honest look at the painful beauty of adoption, and to provide tools to help each woman honestly assess the choices before her. For girls out there that might feel overwhelmed as they try to make the best plan for their child, Love’s Choice is here to help and encourage, providing facts about adoption and tools to help them plan for birth, and either adoption or parenting. 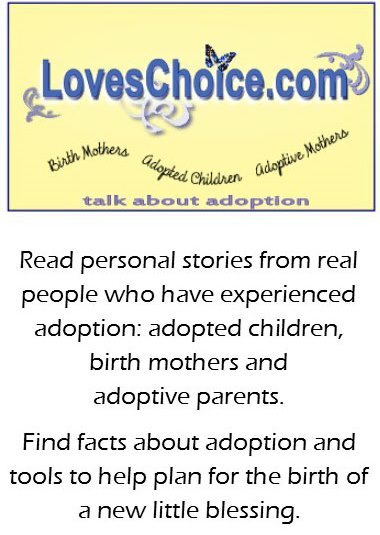 And, most importantly, Love’s Choice shares personal stories from real people who have experienced adoption – adopted children, adoptive parents, and other birthmothers. We want the girls that visit Love’s Choice to make an informed, confident decision about adoption or parenting. If they choose parenting, we hope the process of answering hard questions will make them a better, more intentional mother. StandUpGirl and Love’s Choice are not adoption agencies, nor are they in any way affiliated with any adoption placement programs. For more information about them, please visit them at www.standupgirl.com and www.loveschoice.com and on Facebook and https://www.facebook.com/standupgirl.